Recommended Citation: Lind, M R and E Culler. The Relationship between Information Technology Critical Success Factors and Project Performance. In The Proceedings of the Conference on Information Systems Applied Research 2009, v 2 (Washington DC): §2362. ISSN: 0000-0000. 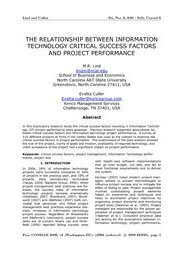 In this exploratory research study the critical success factors resulting in Information Technology (IT) project performance were assessed. Previous research supported associations between critical success factors and information technology project performance. A survey of 116 different projects at firms in the United States was used as the context to examine the critical success factors in project performance. The examination of the data analysis showed the size of the project, clarity of goals and mission, availability of required technology, and client acceptance of the project had a significant impact on project performance.